One day I couldn’t find my salt, so I decided to use the leftover juice from my sauerkraut jar to salt the miso soup I was making. 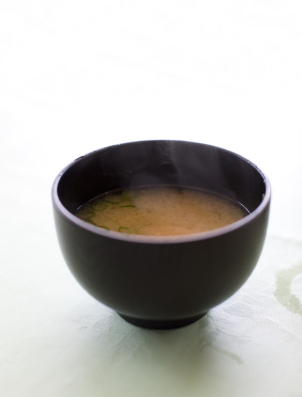 It turns out this is the secret to making miso soup taste like it does in Japanese restaurants but a lot healthier. This gives the added benefit of probiotics. Place water, carrots, celery and garlic in a pot and bring to a boil. Simmer on low for 20 minutes. Sauté shitake mushrooms until soft. Turn off heat. Turn off heat and add bok choy. Let the soup cool and pour into bowls. Add a spoonful of mellow miso and sauerkraut juice to taste.